Mustard greens and mustard seeds are among the oldest known herbal remedies for a great number of health conditions. Originated from the Mediterranean areas, mustard and the herbs from Brassica family were quite popular in the Middle and Far East. These herbal remedies are mentioned in ancient writings of Sanscrit and New Testament. Curative purposes and health benefits of mustard seeds were used in ancient Rome and Greece. In most modern kitchens, both mustard seeds and mustard greens are used for a variety of purposes: to spice up sandwiches, salads and other meals, to preserve pickles and so on. 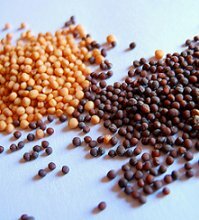 There are three most commonly used types of mustard seeds, including brown mustard (Brassica juncea), white mustard (Brassica alba) and black mustard (Brassica nigra), which are available in powdered from or as whole. Mustard seeds are used for producing oil, which is known for its excellent warming properties and can be used for massages. In addition, mustard seeds have very high nutritional value, being a source of many important microelements and nutrients. One of the healthiest and the least caloric spices, mustard seeds are used in almost every world’s cuisines and are among the world’s most demanded spices, which is especially loved in India, Canada and the US. Mustard seed benefits include anti-cancer and anti-inflammatory properties. Being a great source of selenium and magnesium, mustard seeds can decrease inflammation and reduce the symptoms of such diseases as rheumatoid arthritis or asthma. The seeds also contain isothiocyanates, known for their anti-cancer effects. Other useful elements and nutrients which can be found in mustard seeds and mustard greens are calcium, iron, manganese, phosphorus, zinc, niacin, dietary fiber and very valuable omega 3 fatty acids, which can lower cholesterol levels and protect us from having heart disease. Since ancient times purgative properties were considered the best mustard seed benefits, but nowadays this herbal remedy is valued also for its antifungal and antiseptic effects. Mustard products have been used also to speed up metabolism and this way to improve the function of digestive system. One of the most important health benefits of mustard seeds is being helpful in reducing the frequency of migraines. Mustard products and mustard oil have been effectively used for centuries for lowering high blood pressure and preventing atherosclerosis. Massaging your scalp with mustard oil will help you to substantially improve your hair quality and prevent hair loss. Another interesting property of mustard seeds and mustard green is stimulating salivation and improving appetite. Finally, mustard seeds are considered to be a great source of power and bioenergy, and mustard seeds products can also help you to improve your immunity and assist in fighting against insomnia, as well to treat such problems as anxiety, psychological disorders, the effects of stresses and depression, bronchitis, sexual dysfunctions, the symptoms of menopause, and many others. i added some mustard seeds today to my fruit/vegetable(smoozie). It burned my stomach a bit, is that harmful? I will definitely try the oil for my hair that has since become thin due to menopause. THIS IS QUITE INTERESTING. I KNOW MANY PEOPLE HAVE BEEN EATING MUSTARD SEEDS FOR LONG, BUT HAD NOT BEEN ABLE TO LEARN SO MUCH FROM THEM. THANKS FOR THESE. I HOPE THIS WILL HELP A LOT OF PEOPLE THAT I KNOW, WHO HAVE HEALTH PROBLEMS THAT YOU MENTIONED MUSTARD SEED TO BE CURING.